I really enjoyed this exercise and for the first time felt I was working through a process. 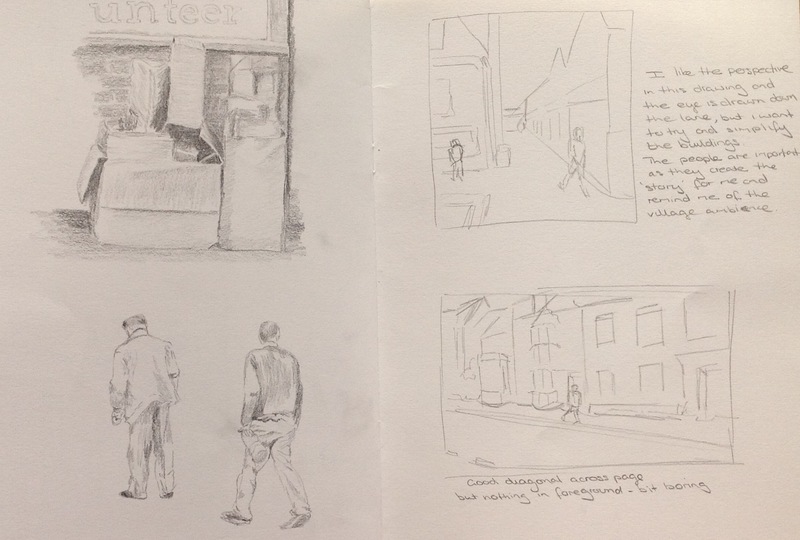 The day I drew my initial sketches was grey, damp and overcast. A few people were wandering about, in and out of the shops and I managed to do quick sketches of them too. 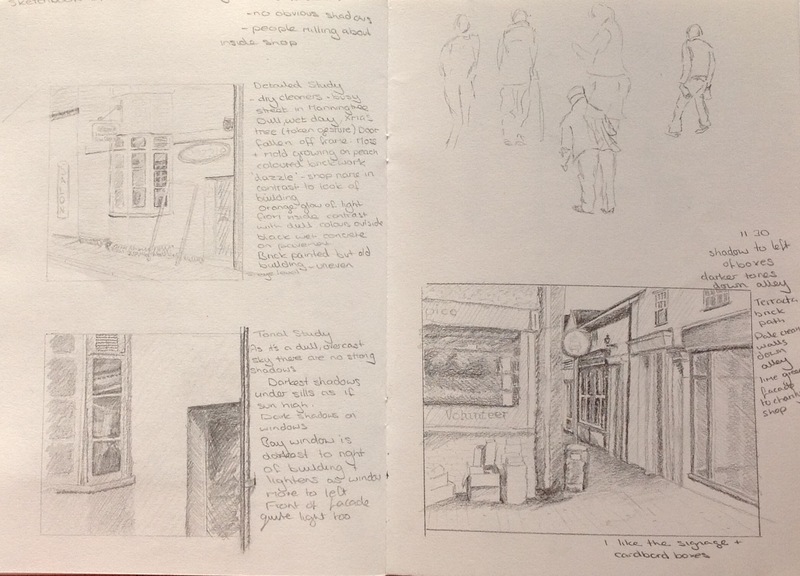 My first sketches in 10cm squares were seen from looking straight ahead at a row of buildings but then I noticed a more interesting view down a side street. I like the signage and stack of cardboard boxes and the wondering of what is round the corner. 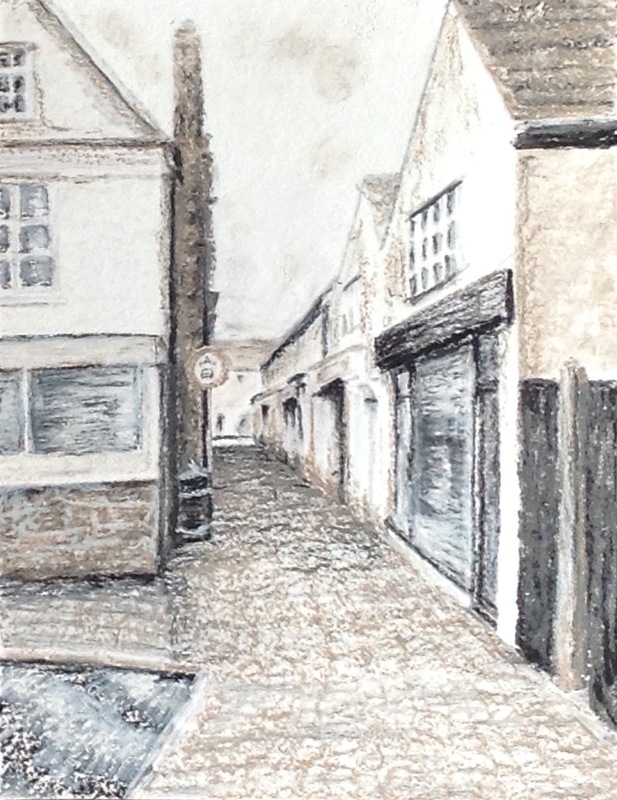 I then drew a couple of quick sketches before deciding on my favourite view, this time looking further down the lane. I like the perspective of the buildings with the sharp diagonals of the roof tops. After looking at John Virtues work I wanted to simplify the drawing and use 2 or 3 colours only. I wanted to try and capture the grey, damp day and although I had intended to add people , in the end it didn’t feel right. I had hoped to use white spirit with the oil pastels to create a looser more watery mark but only succeeded in breaking up the paper so I continued with oil pastels only. At first I felt frustrated with the drawing as it seemed to lack character, but it improved as I loosened up my mark making. It would be interesting to try this again with a different media and to capture a different atmosphere, maybe with people in.